Having in mind regular customers of the Semper showrooms, we have prepared the Loyalty Card program. We wish to honor those Ladies who appreciate the unique design, the best quality and professional service staff members who offer help in our showrooms. After making just one-time purchase amounting to at least 500 PLN the customer is qualified to receive the Card which entitles to a 5% discount. 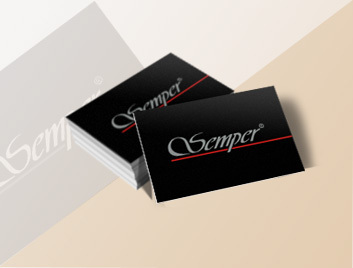 Beside the ability to purchase the collection at a reduced price, the Card authorizes the customers to receive many other privileges and surprises prepared by Semper, having in mind regular customers. Detailed Regulations of the Loyalty Card are available in the Semper Showrooms and on business premises.